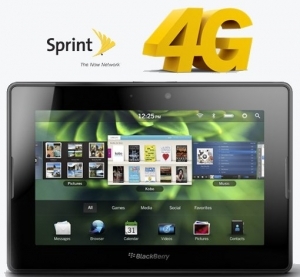 4g BlackBerry PlayBook coming to Sprint this year | BlackBerry Blast! Research In Motion and Sprinttoday announced plans to launch a new BlackBerry® PlayBook™ tablet model featuring connectivity to the blazingly fast Sprint 4G network. The BlackBerry 4G PlayBook™ will be the first BlackBerry PlayBook model to include wide area wireless connectivity, featuring Sprint 4G to give customers download speeds up to 10 times faster than 3G1. This new 4G model is expected to be available from Sprint in the summer.